The last few years, my wife Gina and I have taken a weeks holiday in November somewhere on the West Coast or the Islands to experience the unpredictable and often dramatic weather at this time of year. 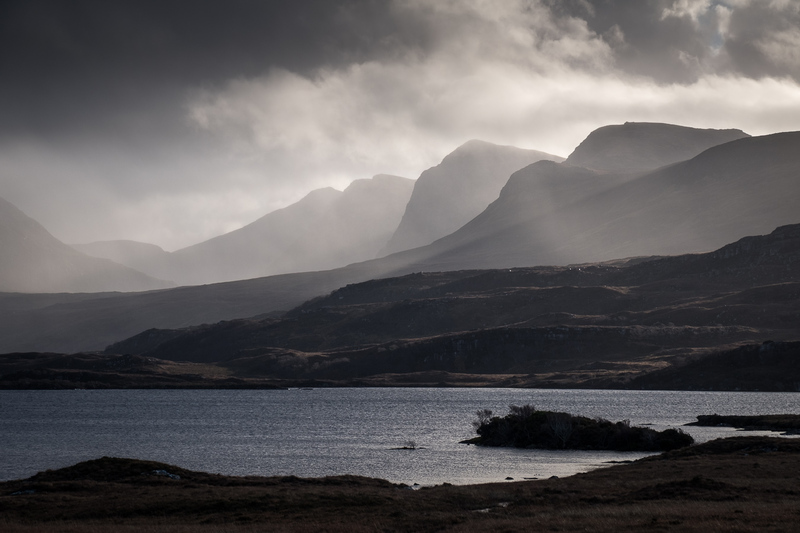 Previous venues have included Polbain, near Achiltibuie, Harris and Lewis. 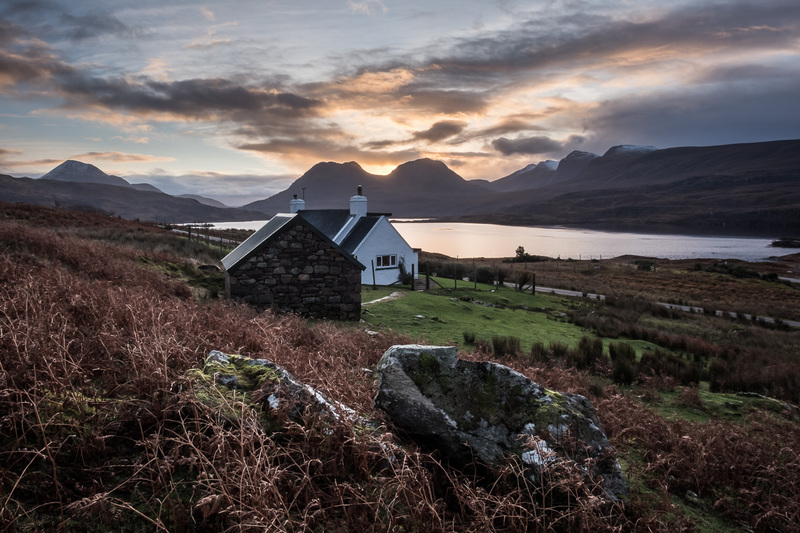 This year I had my eye on a return to Inverpolly and in particular the little cottage that stands near the junction where the road winds its way from the west end of Loch Bad a Ghaill north towards Lochinver. The cottage belongs to Polly Estate and can be booked via their website at www.inverpolly.com. It has two bedrooms (one double and one twin) and represents great value if you fill the cottage and share the cost amongst friends. In terms of location, it is a landscape photographers dream. Stac Pollaidh, Sgor Tuath, Beinn an Eoin, Sgurr an Fhidhleir and Loch Bad a Ghaill are all visible literally from the doorstep. 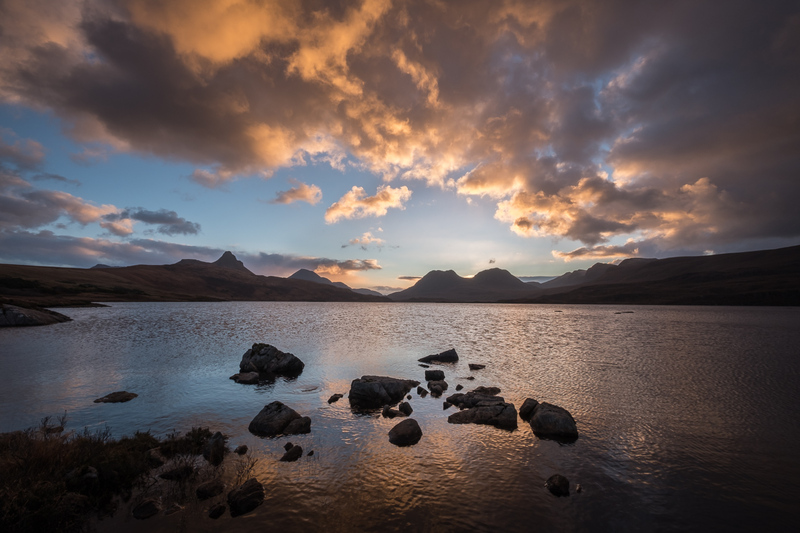 A five minute walk will take you down to the shore of Loch Bad a Ghaill where there are multiple locations for shooting the sun rising over the Inverpolly hills. Walk thirty minutes uphill behind the cottage and you are on the crest of Druim Bad a Ghaill, one of my favourite places to photograph in Scotland and a location well known amongst landscape photographers. The weekly let runs Sunday to Sunday, so we spent Sunday morning at the Inverness Film Festival watching “Edie”, a new film starring Sheila Hancock who plays a rebellious eighty-something year old lady on a mission to climb Suilven, in a bid to rekindle memories of happy childhood holidays with her father. It’s a great film and well worth looking out for when it goes on general release in Spring 2018. 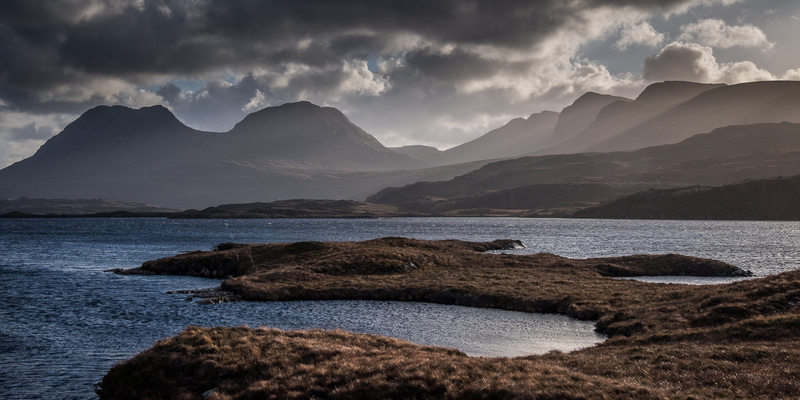 Fired up with beautiful images of the Assynt landscape we headed west, arriving at the cottage just as it was getting dark. The front door was unlocked and we let ourselves in to find the wood burning stove lit and the cottage cosy and warm. David Davies, the owner of Polly Estate come over later that evening to welcome us and go through a few house keeping items such as waste, recycling and how to use the oil-fired Aga. The weather forecast for Monday was for continuous rain all day and so it turned out to be. We had a lazy start and decided to drive to Achins Bookshop at Inverkirkaig for lunch and a browse. Unfortunately, when we arrived, although the Bookshop was open the cafe was closed for the winter. However, the owner was friendly and offered to make us coffee (free of charge!). It turned out that he had also seen Edie at the Film Festival in Inverness that weekend so we exchanged our impressions of the film and heard a few stories of what the film crew and actors got up to during the making of it. Many of the locals appeared as extras and he thought it might give a significant boost to the tourist trade in the area next summer. The Bookshop and Cafe are currently on the market as the owner is retiring, so if you fancy a change of lifestyle this could be your opportunity. A couple of people had expressed interest already, but the banks were proving reluctant to lend the money. We were getting a bit peckish by now, so carried on into Lochinver where a visit to the famous Pie Shop was a must. Appetites well and truly satisfied, we drove back to the cottage through the rain which was still falling steadily. Later on a friend from Inverness was due to join us for the evening and a day on the hill the following day. No photography so far, but the prospect of climbing a hill next day promised opportunities. The rain had finally stopped so we headed round to Culnacraig to climb Sgurr an Fhidhleir, as our friend had not been up from that side and not at all for many years. Gina and I had actually climbed the hill a few times, most recently over the summer, but although it was a fine day that day, the light was not great for photography, with the sun directly overhead during the time we were up there. However, it is such a great viewpoint, I didn’t need too much persuasion to revisit in the hope of better conditions. 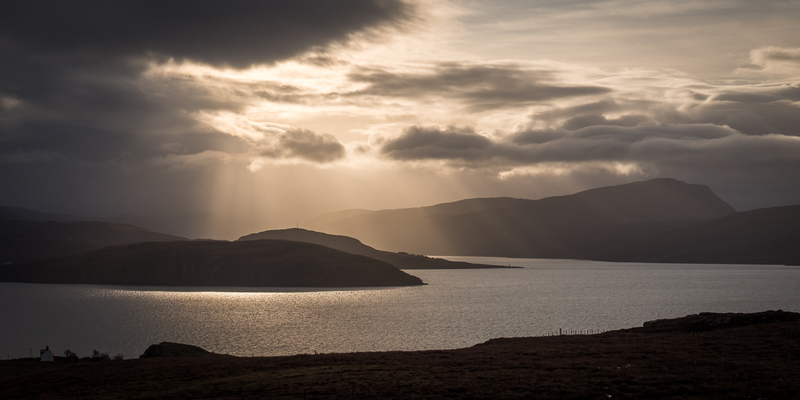 As we left the car, the weather was reasonably fine and I took a few shots looking south west towards Isle Martin. Admittedly there was a cap of cloud on the ridge, however I hoped it would blow off in the stiff westerly wind before we got to the top. Unfortunately, it didn’t. We arrived at the summit in a howling gale and zero visibility. I gingerly inched forward past the cairn towards the drop I knew was there but soon retreated as the wind was threatening to blow me over the edge. We dropped down a little from the summit area looking for somewhere to shelter from the wind when a rain shower blew in to make conditions really unpleasant. With the angle of the rocks and the shape of the summit slopes, there is just no shelter up there from a westerly wind. Luckily we had a brought a two man Bothy Bag which we climbed into and though there was no room for three, our friend got some respite in the lee of our shelter. After a quick sandwich and a mug of hot tea, we decided this was no place to hang about so took a quick compass bearing and set off down into the full force of the gale. Fortunately after losing a bit of height, the strength of the wind eased and we even got a sunny spell which made the walking quite enjoyable. Looking back, the summit was still shrouded in mist and I don’t think it cleared all day, which was some consolation at least. Observing the summit of Sgurr an Fhidhleir over the week, it freqently seemed to be covered in cloud when other hills nearby were clear. A consequence of being the first top to be encountered by the moisture laden air coming in off the sea in the prevailing westerlies I expect. By now it was Day 3 and I had very little to show for it photographically speaking. The weather however was continuing to improve and it was now both dry and calm, if somewhat overcast. We decided that Gina would fulfill a long held ambition to cycle the twisting road from the cottage to Lochinver while I would take the car over the same route, stopping for photography along the way and pick her up at the other end. So that is what we did. 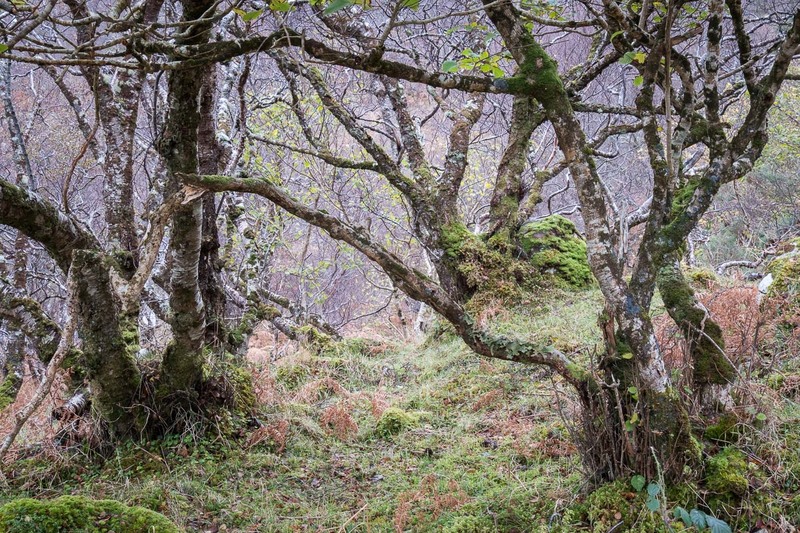 The light was rather flat and the sky too uniformly grey for the big vistas, but there was plenty of nice woodland and lochans to keep me interested along the way. I caught up with Gina just before the last hill down into Lochinver where we enjoyed a pleasant lunch in the An Cala cafe next to the Culag Hotel. 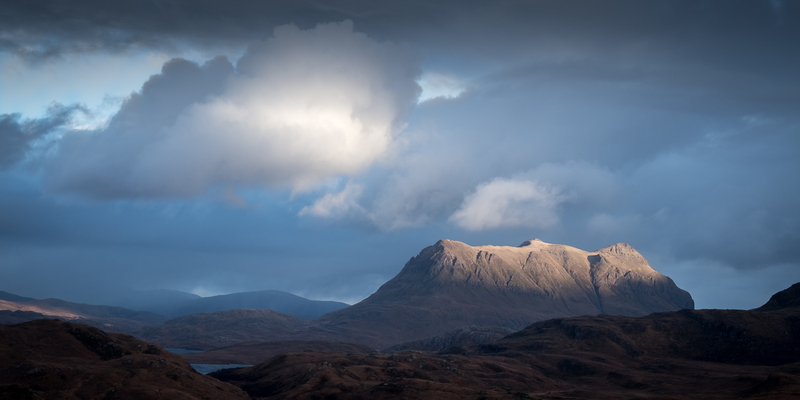 Although the day had been largely cloudy with little real “light”, I felt I had flexed my photographic muscles at last. 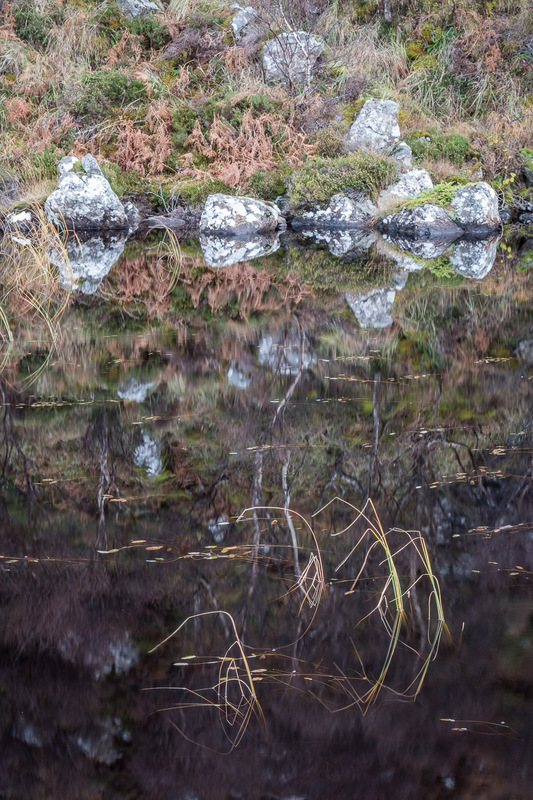 The day started overcast and showery but by 9am the weather had dried up enough to risk a first foray down to the shores of Loch Bad a Gaill. 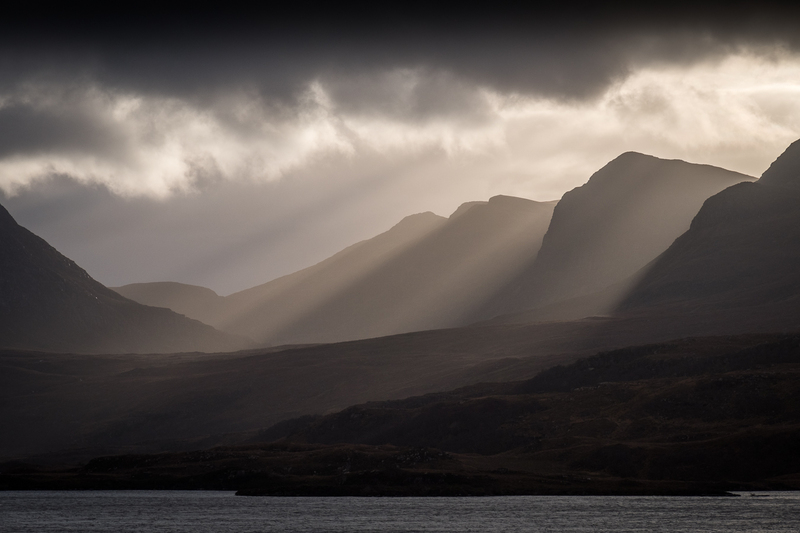 Initially the sun stayed firmly behind the clouds but there were a few gaps and patience was rewarded when eventually around 10.30am rays of light streamed out and across the face of Sgurr an Fhidhleir in quite dramatic fashion. For the next hour and a half the clouds and sun played hide and seek with each other producing some lovely light effects while I hopped along the shore and over the hillside trying to capture some of it. By 12 noon the best was over so I wandered back up to the cottage for some lunch. The rest of the day continued to look promising with a forecast of sunshine and showers. At 1.45pm Gina dropped me off at the top of the road over Druim Bad a Ghaill and then went off to visit Achnahaird beach. I set off along the ridge to the west intending to walk back to the cottage under my own steam. I was glad of my new Muck Edgewater II boots, bought specifically for this trip, as the terrain here is extremely wet and boggy. 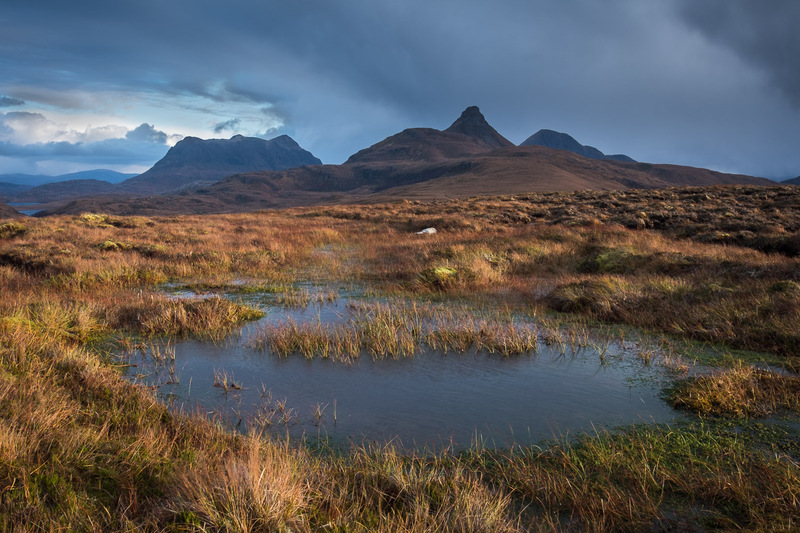 As soon as I stepped out of the car and walked away from the road, I could see there was great light about but it was changing rapidly as clouds blew across on a stiff westerly breeze. 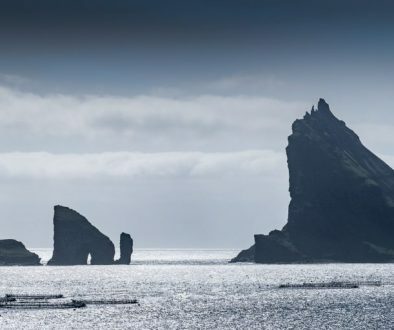 The views from here to the east and north east are spectacular, taking in Stac Polly, Cul Mor Suilven and Canisp, all cresting the horizon with their individual iconic shapes. Suddenly there was a burst of light on the moor where I was standing so I ran to find some sort of foreground and composition to make use of it. Conditions were changing so fast, it was almost a risk to use the two second self timer, as the light could be gone between pressing the release and the shutter firing. I wandered along the crest of the ridge towards the highest point, passing familiar boulders on the way and looking for features of various kinds to use as foregrounds. 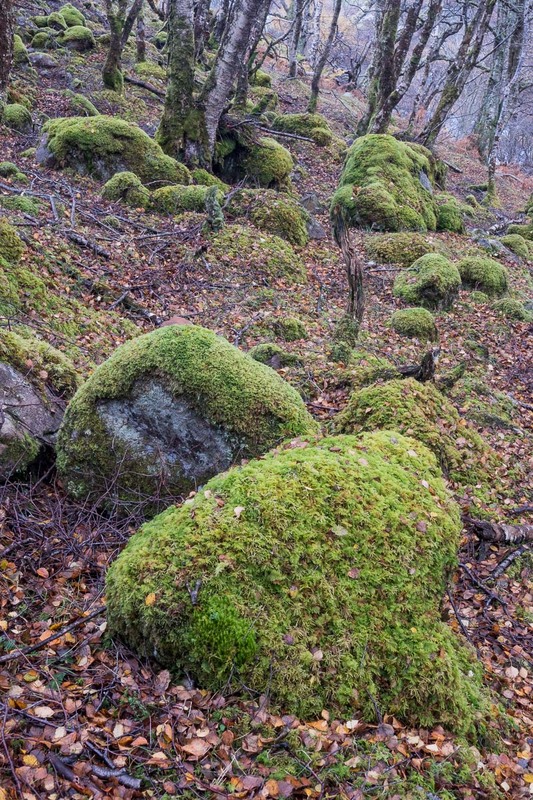 There is no shortage of these hereabouts as the moor is littered with rocks, slabs, pools and lochans in all directions. If I found a particularly attractive spot, I waited and hoped a burst of light would hit where I was standing. Sometimes it did and sometimes I was unlucky but that’s all part of the fun. 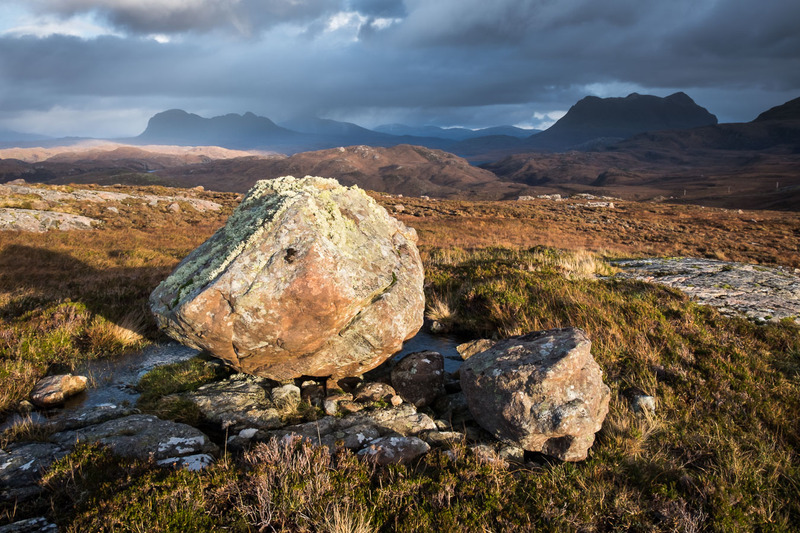 Occasionally a shower would blow through on the wind so I sat down in the lee of a boulder and watched it pass over the landscape, shrouding and revealing each mountain in turn. Magic. Eventually the sun sank behind a bank of cloud in the west and I had to tear myself away. It was a very short walk downhill back to the cottage where I arrived at 4.15pm just as it was getting dark. Two other friends had just arrived from Edinburgh with their golden retriever Brodie to stay the rest of the week with us. Photographically speaking, it had been an amazing day, by far the best of the trip so far. But there was more to come. 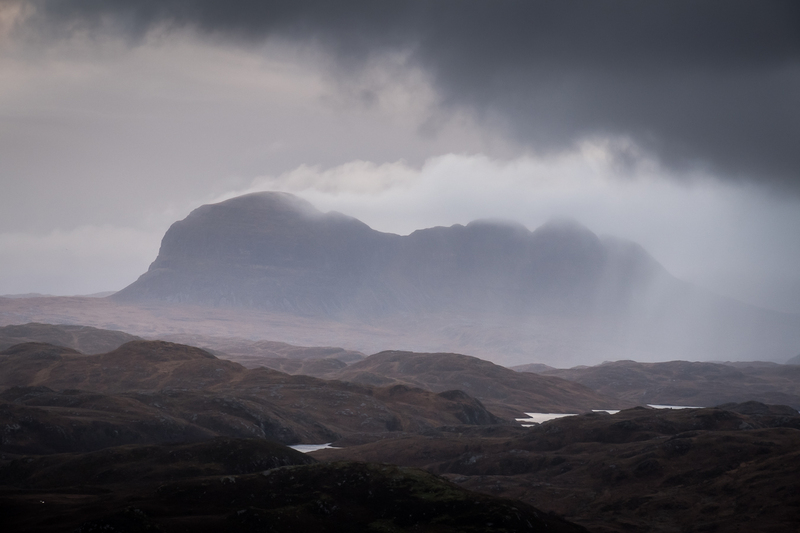 There was more cloud today with a stiff breeze and the occasional shower so we decided to explore the trails at Little Assynt, three thousand acres of classic Assynt landscape owned and managed by the local community. They have done a great job, building a small network of paths and planting native trees. 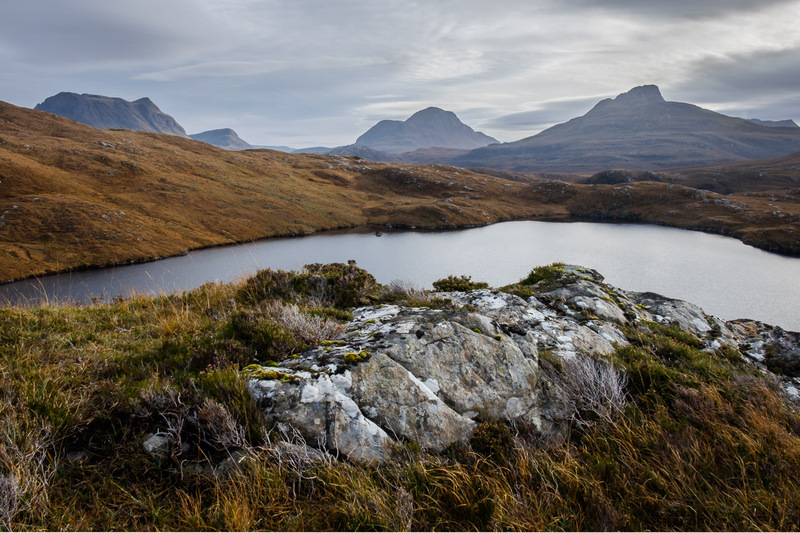 We made an anticlockwise circuit of the 4.5km Loch an t-Sabhail trail which starts at the Little Assynt Tree Nursery. The weather wasn’t great for photography but the trail was excellent and there was even a turf roofed shelter for lunch, which we reached just as a shower blew in. 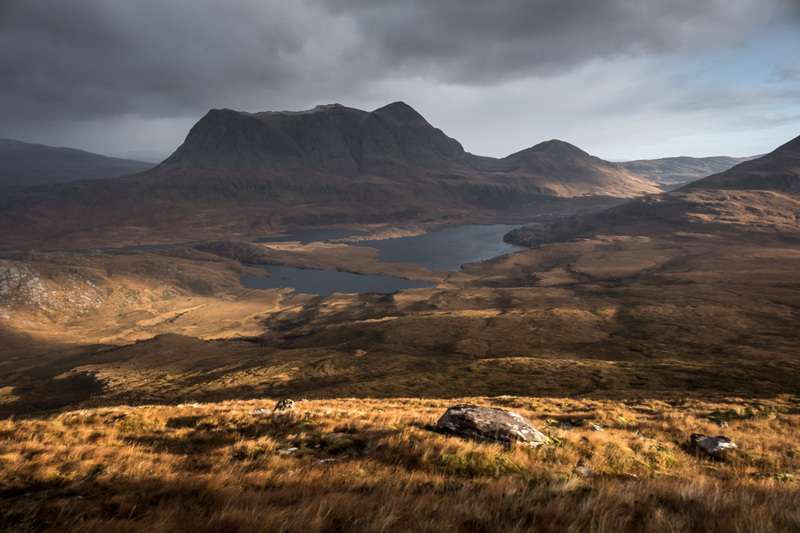 I recommend including the short extension called Ken’s Path which takes you over a small ridge and gives good views of Suilven, Quinag and Loch Beannach with its many islands. I rarely manage to drag myself out of bed for a dawn shoot, but I hoped that being right on the spot this week might at last offer me the opportunity to try and get out in time for sunrise. In fact sunrise in November this far north is not until about 8.15am so I really had very little excuse not to at least give it a go. The forecast for today looked promising so I set the alarm for 7.30am. I looked out of the bedroom window and though it was only just getting light, I saw a patch of clear sky in the east above Beinn an Eoin and Sgurr Tuath. Excellent. I had a quick shower, got dressed and walked the few hundred metres down to the shore of Loch Bad a Ghaill where I arrived at 8am. I had a few minutes to scout out a nice foreground before the clouds started to light up and I was treated to a full on colourful sunrise. I could hardly believe it. I spent the next hour and a half exporing along the shore of the loch as the light, colours and clouds constantly changed. Eventually, the show was over and I wandered back up to the cottage for breakfast. If only all sunrise shoots could be this easy and enjoyable. The weather looked set fair so we all decided on an ascent of Stac Polly, though only as far as the East top this time as Brodie the dogs lack of scrambling skills were likely to be a limitation on the ridge and the final ascent to the true summit of the west top. The sunny spells of earlier in the morning continued as we made our way up the path. 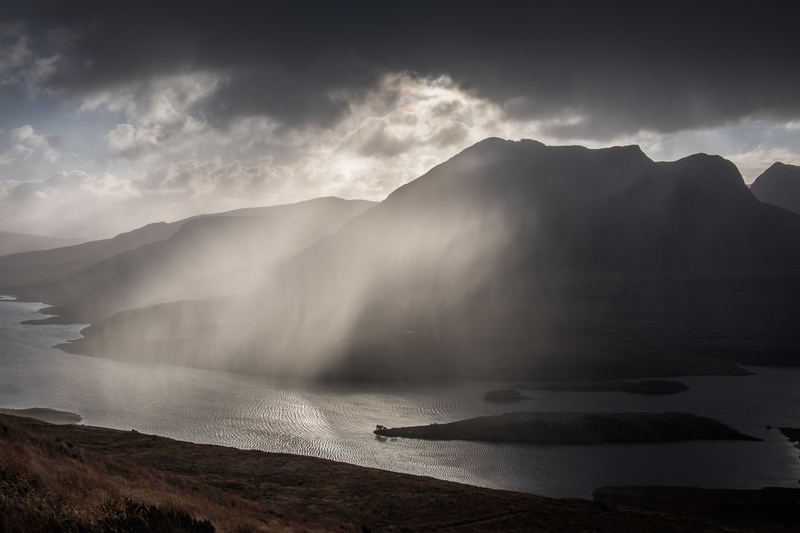 The best light was behind us as we climbed so I had to try to remember to stop occasionally and look round to make sure I wasn’t missing anything, such as the backlit shower passing in front of Sgorr Tuath below. We soon rounded the East Buttress and decided to stop for lunch just before the path began its steep ascent onto the ridge, as the wind was likely to be much stronger up there. 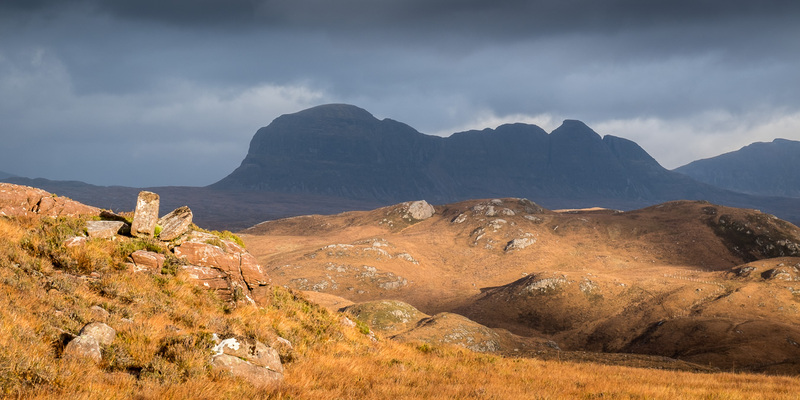 The view north and north west from here towards Suilven and Cul Mor is always inspiring so I took the chance for a spot of photography while the others were eating. 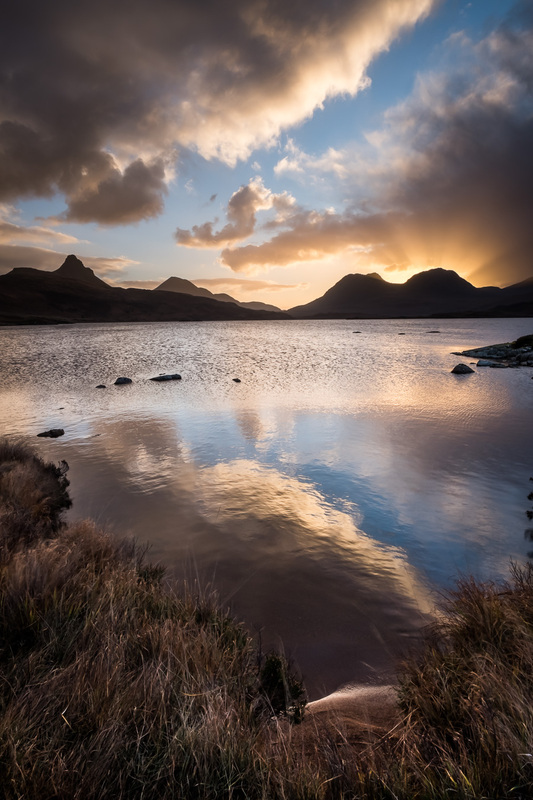 Slowly the conditions began to improve until a golden light spilled across the whole landscape, enhancing every knoll and lochan. We continued our ascent and soon arrived at the East Top where the views were epic and particularly dramatic to the south towards Beinn an Eoin and Sgurr an Fhidhleir. The others carried on along the traverse path to the north of the ridge whilst I found it hard to leave whilst the light was so good. 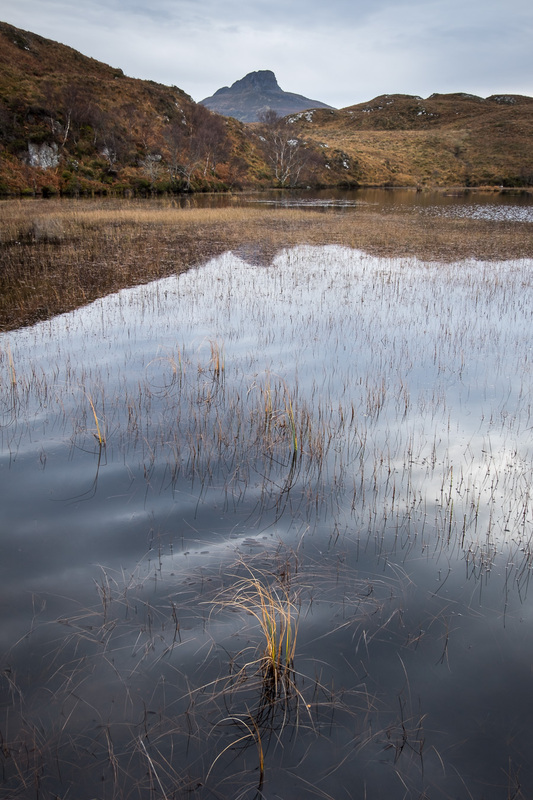 At one point the waters of Loch Sionascaig seemed to glow a pearly opalescent blue such was the nature and angle of the light falling on to it. Eventually I managed to pull myself away and followed the others on the traverse path, descending underneath the West Buttress and eventually completing the circumnavigation of the hill. We had managed to dodge what showers were around and reached the car park just as the first few spots of rain began to fall. 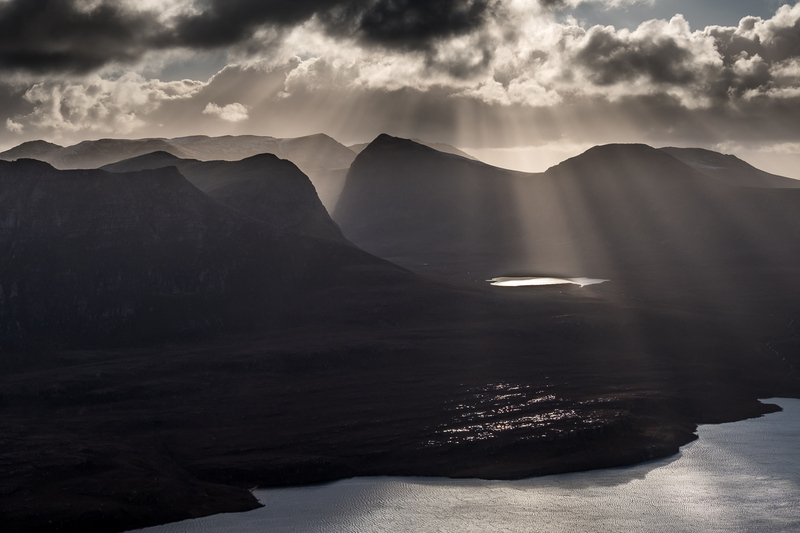 I have climbed Stac Polly many times but have rarely been witness to such a display of light as we saw today. Sadly all good things come to an end and we had to leave Badagyle Cottage. We were the only occupants in the whole of November and there were no other bookings until the Christmas and New Year weeks. Obviously you take a chance with the weather in November and though we had a shaky start to the week, we were lucky and in the latter part were treated to some amazing light. 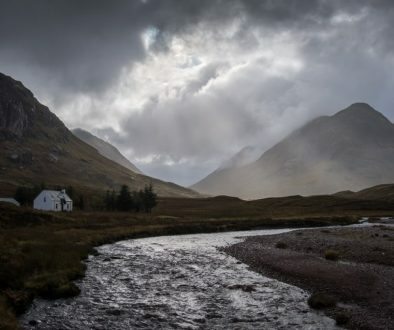 So if you are looking for comfortable accommodation in the heart of one of Scotlands most photogenic landscapes, this could be just the place for you.